News & Events - Count of Monte Alea Foundation, Inc. The Count of Monte Alea Foundation for the unity of Spain under one flag. January 5th, 2019. The staff of the Count of Monte Alea Foundation wish you a happy holiday season and best wishes for the new year. September 15th, 2018. The Foundation has provided a grant of 1,000 USD to the Sunu Askan Foundation to purchase two computers to be delivered to the Matar Diop primary school located in the city of Medina in Dakar, Senegal. October 20th, 2017. Mr. Alejandro Perez de Buerres, general secretary for the Count of Monte Alea Foundation has been admitted as knight of the Corps of the Asturian Nobility in a ceremony held at the church of San Tirso el Real in Oviedo, Spain on October 15th. The Corps of the Asturian Nobility is the only European Nobiliary Corporation that has as Spiritual Protector Pope Francis. ​August 20th, 2017. La Fundacion Conde de Monte Alea se une al dolor del pueblo Catalan y Espana por el incomprensible atentado terrorista que se ha perpetrado en la ciudad de Barcelona. July 5th 2016. Dr. Bernardo Perez de Buerres Ramirez has been appointed delegate in Boston, Massachusetts for the Royal Cavalry Armory of La Habana (Real Maestranza de Caballeria de La Habana) originally founded in 1709 and approved by Royal decree of H.M Phillip V King of Spain on 26 of August 1713. February 7th, 2016. The book entitled "El Vizcondado de Campo Grande" by the author Carmen Lopez Cerezano, was presented at the Centro Asturiano de Madrid in Spain on February 2nd. The book was edited and co- sponsored by the Colegio Heraldico de Espana y las Indias, The Academia Asturiana de Heraldica y Genealogia and the Count of Monte Alea Foundation. April 15th, 2015. On April 8th, 2015 the Count of Monte Alea Foundation, Inc. was granted Special Consultative Status with the United Nations Economic and Social Council (ECOSOC). With this Special Consultative Status, the Foundation is permitted to send representatives to participate in meetings of ECOSOC and subordinate bodies, make statements and establish cooperative work relations with departments, programs and agents specialized in specific themes of the United Nations. February, 3, 2014. The Foundation has established an agreement with the San Jose school in Chincha Alta in Peru to sponsor the education of children with limited economic resources. 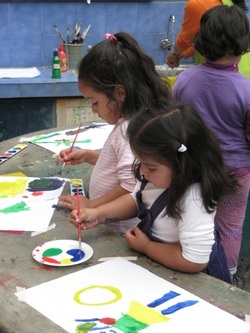 The scholarships provided by the Foundation give access to elementary school education for a minimun of three years. July 13th, 2013. ﻿﻿Representatives of the Corps of the Asturian Nobility, The Royal Military Estamento of the Principality of Gerona and the City of Viana, were received at the Zarzuela Palace in Madrid by HRH, Don Felipe de Borbon, Prince of Asturias. At the occasion, Prince Felipe was presented with a copy of the book entiled:"Los Principados y Titulos del Heredero de la Corona. En el V centenario de la Reunifcacion de Espana(1512-2012)" The book was partially sponsored by a grant from the Count of Monte Alea Foundation to the Academia Asturiana de Heraldica y Genealogia. March 21st, 2013. The Foundation's president, Dr. Bernardo Perez de Buerres Ramirez has been awarded with the Sacra Militar Constantinian Order of Saint George in a ceremony held at the Church of Saint Gines in Madrid. Dr. Perez de Buerres was admitted in the degree of Knight of Grace. The insiginas were bestowed by the order's Spanish Delegate Dr. Alfonso de Ceballos-Escalera y Gila, Marquis de la Floresta and Vizcount de Ayala. August 3th, 2012. Marie-Noelle Del Alamo was appointed to the Foundation's Board of Advisors. Her main focus will be on rural education in Peru where she will serve as Director of Peru Operations for the Foundation. She is a Belgian citizen and has worked and lived in Latin america and France. Ms Del Alamo is trilingual (English, French and Spanish) and received a Bachelor's degree from the French Business School and a Master's in Educational Psychology from Harvard University. Her contacts in Peru allowed her to support a wide range of organizations in Lima and the provinces, more recently working in collaboration with the Peruvian agency DEVIDA to find solutions against domestic violence for families with young children. She is the founder of Learn in Peace, Inc.
June 6th, 2012. Dr. Bernardo Perez de Buerres Ramirez, President, CEO and founder of the Foundation gave a seminar entitled: Origens and Evolution of Spanish Heraldry. The seminar was organized by the Spanish Cultural Association of Boston and held at the Real Colegio Complutense in Cambridge MA. The event was attended by members of the Spanish community of Boston and followed by a cocktail. February 5th, 2012. Our prototype web site was launched . We are still working to optimize our internet presence. Hence, we ask for your understanding while we continue improving the site. In the future we expect also to have the web pages written in Spanish to extend our reach to the areas that we are helping in Chile, Peru and Spain.